“The Tokyo street scene is best at night, like a fashionable beauty. Electric light is cheap and competition is keen, and Ginza at night is more like foreign fireworks than a busy shopping street. By day its appearance rather suggests that some Japanese architects, after a rapid tour of Germany and Venice, had woke up on Coney Island and immediately started to draw elevations. 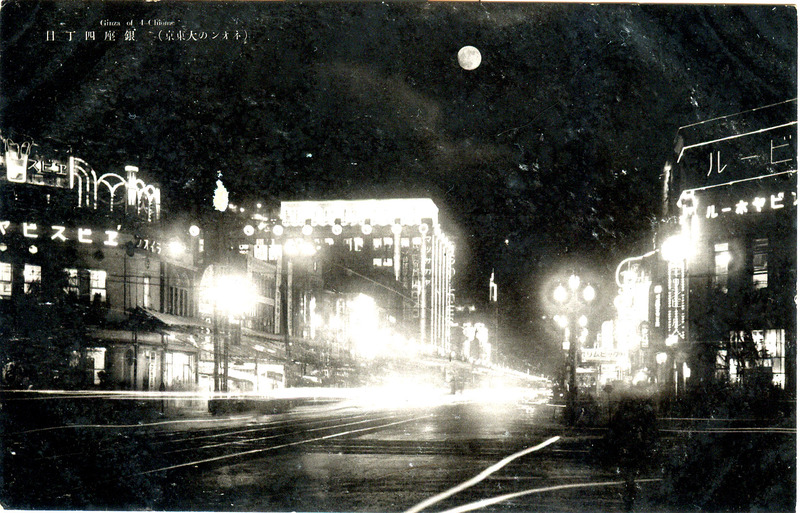 Ginza at night under a near-full moon, looking toward Ginza Crossing, c. 1935. At center, draped in neon, is Matsuzakaya department store. Ginza-dori is flanked beer halls. To the left is Yebisu Beer Hall, one of the oldest beer halls in Tokyo (1899), and to its immediate right is Lion Beer Hall, with its gorgeous Art Deco and Gothic interior, that first opened in 1934. I came and saw the moon; how thin it was.